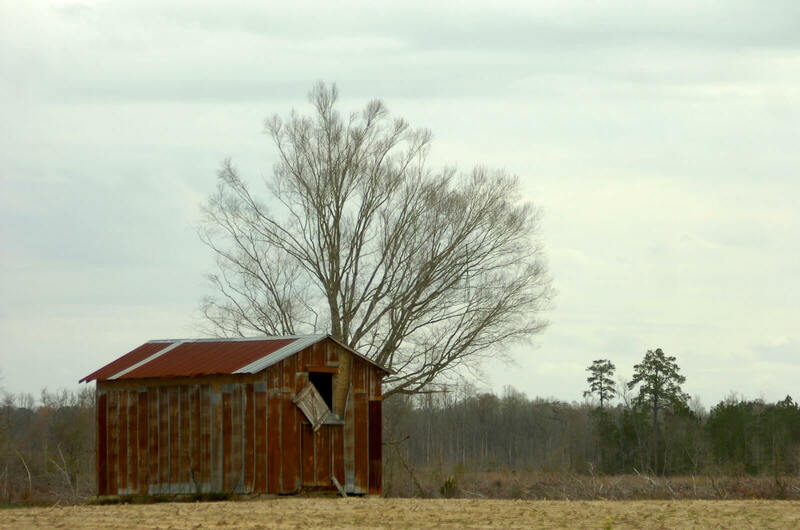 A unused tobacco barn in Columbus County, North Carolina. Tobacco used to be an agricultural staple in North Carolina; since its decline, county budgets have faced new deficits, often leading to a lack of funding for mental health care. Photos by Les High for The News Reporter. Over the coming weeks, The News Reporter and Scalawag will trace mental health and substance abuse in Columbus County, North Carolina, and will look at what is and isn’t working as institutions shape how community members face those issues and search for help. In a six-part series, we will explore how opioid use, law enforcement, hospitals, and schools address and are affected by mental health care. Columbus County faces some of the steepest challenges on this front in North Carolina or the South. But this series will conclude with the good news: Despite the wide reach of the county’s crisis, interventions across the board can improve health outcomes. The News Reporter and Scalawag will tackle some possible solutions with implications for Columbus County and communities throughout the South. Today, the series begins with a dive into how the county’s behavioral health system took its present shape. If you have a question about mental health in Columbus County, Andy Anderson is a good man to ask. He is the development director and former CEO of Community Innovations, a service provider for patients with intellectual disabilities. He pastors, often acting as the first point of contact for the suicidal or hospitalized in his flock. He has raised six foster children, and seen firsthand the damage that drug use does to families. He is a successful man who by all appearances has his life in order. He has also struggled with depression himself. That deficit sends the mentally ill to systems not designed for them: Many end up in hospital emergency rooms, more stable but far from receiving the full treatment they need. On one November day, seven such patients were waiting in the Columbus Regional Healthcare System emergency room for placement elsewhere, occupying half of the ER’s beds. Others, committing what is often a slight infraction, end up behind bars. And for the less acutely ill, who may simply be dealing with excess mental anguish, there are pills to take the pain away. In each case, receiving treatment is significantly more difficult for the poor and the uninsured. Nearly a fifth of Columbus County’s population—18.6%—lacked insurance in 2016, according to Columbus Regional’s quadrennial Community Health Needs Assessment. Mental health services for those with Medicaid or without insurance in Columbus County are routed through Eastpointe, a “Local Management Entity/Managed Care Organization” that was chosen by North Carolina to connect patients with service providers. Like other LME/MCOs in North Carolina, Eastpointe has come under fire in recent years for mismanagement of funds—former CFO William Robert Canupp was sentenced this summer to three years in prison for embezzling half a million dollars in kickbacks from contractors, which he used to buy an $80,000 boat, a gaming system, and a hunting rifle and scope. The more common complaint, though, is that Eastpointe sits at the center of a healthcare provision system that is scattered and illogical. This system makes it hard for people to even find the help they need—never mind actually undergoing treatment. James Prevatte, Columbus County commissioner and member of the Eastpointe board of directors, remembers looking at mental health options in the county and seeing a need for a walk-in clinic. It didn’t used to be this way, Prevatte recollects. Through the 20th Century, North Carolina’s mental health system was divided into smaller area programs, which placed a public mental health administration in almost every county in the state. These programs handled state and federal dollars spent on mental health, including through Medicaid, and they offered some services themselves. Until the early 2000s, thanks to county administrations, if someone was experiencing a mental health issue, there was one central location they could turn to for care. “The state decided it was a conflict of interest for the agencies to both coordinate care and to provide care,” explains Marisa Domino, professor of health policy and management at the University of North Carolina’s Gillings School of Global Public Health. “As part of the state mental health reform in the early 2000s,” Domino says, “there was a movement at that time toward privatization.” As such, services formerly in the ambit of area programs were outsourced to private providers through LME/MCOs like Eastpointe. Meanwhile, community needs that had been overseen by area programs were burgeoning as the state’s number of inpatient beds dwindled. In the latter half of the twentieth century, North Carolina was swept up in a national movement toward “deinstitutionalization,” which focused on closing down large inpatient psychiatric hospitals where patients with acute mental illnesses stayed long-term. Instead, proponents of deinstitutionalization argued, patients should be reintegrated into community-based care, within familiar social structures that could support them more fully and humanely. But that community-based care rarely materialized. North Carolina’s flagship psychiatric hospital, Dorothea Dix, shuttered in 2012 after a long wind-down. As the patients left the state facilities, though, there was no plan in place to care for them, says Vickie Pait, a Whiteville city councilwoman and executive director of the domestic violence shelter Families First. “When they started talking about mental health, it was clear that they hadn’t done any research—just said ‘reform,’ and then that really meant just taking it away,” Pait says. The money that was supposed to support the enhanced community-based care never fully materialized, and private providers failed to grow to meet the existing need. Meanwhile, rural North Carolina’s economy faced new challenges. The tobacco industry, once the backbone of North Carolina’s agricultural economy, wheezed as sales dropped in the 80s and 90s, thanks to health worries and cheaper foreign tobacco. Columbus County was hit hard. Whiteville Apparel, a textile sewing plant that once employed 600 workers, closed down in 1999 after NAFTA opened up cheaper labor markets. United Carolina Bank, headquartered in Whiteville, was bought by BB&T in 1997, moving the bank’s headquarters out of town. Wal-Mart’s move to the outskirts of Whiteville in 1989 wore down the smaller downtown businesses, emptying out what was once a thriving commercial center. A confluence of factors meant that the city and county found themselves much poorer around the turn of the millennium, with fewer jobs and less stability, just as mental healthcare was becoming more difficult to come by for those without much money. A canoe trip on the Waccamaw River in Columbus County. The gaps in mental healthcare that resulted have had major consequences. And those who slip through the cracks fall somewhere. In many cases, Columbus countians simply self-medicate. Opioid prescriptions, and opioid use, exploded in the 90s and into the 2000s. In October, the Trump Administration declared the opioid crisis a national public health emergency. The crisis is felt acutely in Columbus County, which has the highest rate of opioid prescription of any county in North Carolina: Data from the Center for Disease Control shows that providers wrote 178 opioid prescriptions for every hundred people in the county last year. The opioid crisis and mental health issues prevalent throughout the county have entwined themselves together to the point of inseparability. Those hoping to escape their own heads often turn to pain pills, or to heroin or fentanyl. Opioid users, in turn, often develop substance use disorder, a more sympathetic psychiatric term for addiction. The lengths to which users go to procure their fix can invite further trauma—one man, who wished to remain anonymous, told The News Reporter and Scalawag of retrieving his daughter regularly from a “whorehouse” after she became addicted to pills. Those with behavioral health issues, due to poor mental health or to substance abuse or to a combination of the two, often end up in the emergency room or jail. Carla Hollis, CEO of the Columbus Regional Healthcare System, notes the change in her emergency room. “Any given day, you can go down there and see about five or six people who have been involuntarily committed,” she says. Those patients stretch the resources of the hospital, which must assign a nurse to watch each involuntarily committed patient to ensure that the patient doesn’t do himself or others any harm. There is no psychiatrist on staff. The goal with such patients is to get them into a more appropriate facility, but North Carolina’s state inpatient facilities are overwhelmed. So that process can take days, during which patients are stuck waiting in the emergency room. And the patients languishing in the hospital may be the lucky ones. Many are minded by a sheriff instead of a nurse. Studies consistently show more mentally ill individuals housed in jails and prisons than in hospitals; a 2014 study by the Treatment Advocacy Center and the National Sheriff’s Association suggested a tenfold difference in those numbers. Instead, Columbus County has an underserved population struggling with behavioral health too often on their own. “In rural North Carolina across the board, we have limited resources and we have big-city problems. We have the same problems as New York, and we don’t have the property value,” says Anderson, the pastor and provider for patients with intellectual disabilities. But Anderson sees hope, too. “In Columbus County, we do have community,” he says. “And we have community that will come together around an issue. When we had the lowest health score in the state, we were 100 [out of 100], folks came together and we’re working on that.